A total of 281 fatherless girls from different communities will exchange wedding vows during the ceremony. A mass marriage ceremony – Ladakdi – will be organised by Maruti Impex Grop, on 18th November at Bhavnagar in Gujarat. A total of 281 fatherless girls from different communities will exchange wedding vows on this day. 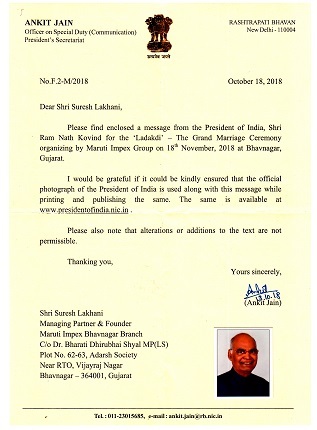 Honourable President of India, Ram Nath Kovind has also extended his warm greetings and felicitations to all those associated with the group. The President has extended his best wishes for the success of the programme. Maruti Impex Group, managed by Lakhani family is committed to supporting the society by engaging in philanthropic activities and has come forward in initiating such event by financing and hosting the entire event.